Here is a another free brush set! 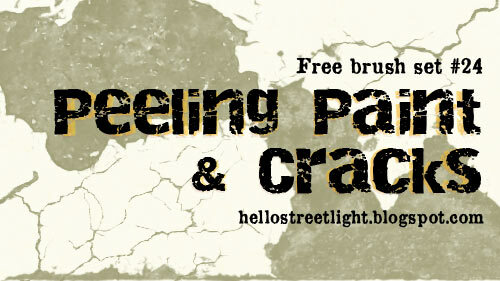 This pack consists of peeling paint and crack brushes. Making this set took me longer than I expected. I found the peeling paint on a rusty railing. As for the cracks, they were taken from a rubbery surface with a fabric-like texture making it really tough to extract. I wanted to keep the fine (hairline?) cracks as well so that I had to resort to manually erasing the cracks' background whew! These crack brushes are a bit experimental so I'd love to hear what you think of it. You can create more cracks by overlapping these brushes over each other or try forming them into one continues crack. The fine crack brushes also work well if you try making them smaller and adding them to the edges of the larger ones. To add variation, you can also resize the brushes and rotate them around via the Brush Tip Shape option found in the Brushes window (Window » Brushes or F5). You can also try playing around with their Blending modes if you are using them over a texture.